Unlike risotto, you’ll find yourself satisfied with its rich flavor profile but not too weighted with the richness of rice. 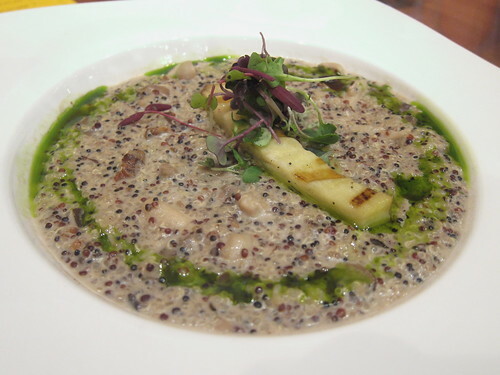 And where better to enjoy quinoa than at Ricardo Zarate’s fast-paced Peruvian restaurant in the heart of Downtown LA? After all, quinoa is basically old news for Peruvians. It’s also perfect for herbivores and omnivores – and nutrition nuts – alike, since quinoa is a complete protein (not to mention fiber, phosphorus, magnesium, iron and even calcium). The wild mushrooms bring in a ton of savory flavor robust enough to satisfy anyone. Have it for lunch – the Comida Lunch Special is only $15 and comes with 2 sides: rice and a dessert, or have it for dinner as an entree. The choice on how to welcome fall to Los Angeles is yours. This entry was posted in cocktails, Downtown LA, Food, L.A., lunch, wine and tagged @mochicala, autumn, chef, complete protein, DTLA, fall, favorite dish, Mo-chica, mushrooms, Peruvian, protein, quinoa, quinotto, Ricardo Zarate, risotto, Stephane Bombet. Bookmark the permalink.